Like many American Jews in the last decade, I first travelled to Israel through the Birthright (Taglit) programme. In just ten days, the goals of Taglit had been met as far as I was concerned. Israel’s importance in my life had shifted from a country we always discussed in the High Holidays’ imaginary roughly the size of New Jersey to the beacon of pan-nationalist Jewish sentiment. How could I not be moved by the stories of oppression and victory? The Yad Vashem Holocaust Museum? Or even the climb up Massada where the guide recounts the tale of how Jewish extremist rebels, known as the Sicarii, overcame the Roman garrison by committing mass suicide rather than becoming enslaved to those that had destroyed the Second Temple in 70 CE. Upon my return to my college campus, Israel advocacy became a top priority winning me even a few more trips to Israel with the American Israel Public Affairs Committee. I was able to meet analysts, professors, Israeli MPs and even Michael Oren, who now holds the key office of Israel’s Washington ambassador. It wasn’t until a few years ago when I lived in Israel that I realised that the “only democracy in the Middle East” I had fought to uphold already faced much more of a touch-and-go reality. Palestinian Israelis were second-class citizens. They received a bottom-tier education in state schools and had difficulty accessing basic goods and services. History books were filled with historical revisionism that negated any narrative about the foundation of the state of Israel that was not Zionist. The status quo and locked peace process was never our fault nor did we bear any responsibility. Everything became about “us” versus “them”. And whilst I understood genuine concerns about another intifada, it was then that it became crystal clear to me that Israelis were being short-changed by their government on the type of egalitarian country those kibbutzniks fought to build. In the three-year period between the 2006 war with Hezbollah and Prime Minister Benjamin Netanyahu’s return to the office of Prime Minister in 2009, the country operated in complete schizophrenia. On one hand, Noam and Aviva Shalit held countless rallies to bring their son Gilad Shalit home on Rabin Square as liberal Israelis condemned their government’s uselessness. While on the other, settlement building binged, American Jewish donors threatened to take away the funding from Ben Gurion University if professors like Neve Gordon didn’t keep quiet about divestment and Israel’s religious high court pushed to have more weight than the Supreme Court. It was obvious to me, as well as my journalist cronies living in Israel at the time, that the tension could not go on forever. After all, two-way democracies don’t really exist. The belief that you can only reap the benefits of equality if you are actually “just like me and agree with me” is incongruous with a pluralistic society that establishes checks and balances by way of dissent. And while we did foresee a clash between a right infused with religious Zionist (and racist) ideals and a more moderate Israeli society on the fence about its future, we hoped, or at least I did, that an increasingly globalised world would stop these precipitating measures. There was no way a modern country would give up years of working to solidify democratic institutions in order to maintain hegemony at the cost of recidivist policies. As Tobias Buck explains in his Financial Times article, three pieces of contentious legislation have passed the Knesset with a few more bills on their way. “The first is the so-called Nakba Law, banning any state-funded entity – including schools and theatres – from commemorating the Nakba, or catastrophe. The term is central to the Palestinian understanding of recent history: it refers to the 1948 Arab-Israeli war, when hundreds of thousands of their ancestors were expelled or fled from advancing Israeli troops. Critics say the ban is a blatant violation of freedom of speech – as is the so-called Boycott Law, passed earlier this year. It introduces a long list of penalties for any Israeli who advocates an academic, cultural or economic boycott of Israel, including the Jewish settlements that, contrary to international law, exist in the occupied Palestinian territories. …One widely debated bill seeks to clamp down on foreign government donations to Israeli human rights groups and NGOs that criticise the government and army; another calls for a massive increase in damages that newspapers would have to pay in libel cases. It has been denounced by the press as an attempt to silence critical reporting”. These measures have even raised the eyebrow of the Anti Defamation League’s Abraham Foxman. Known for his unequivocal stance with Israel, Foxman wrote in the Huffington Post last month that these laws would hurt Israel perception abroad “as defending democratic values are crucial to Israel’s good name”. I understood one day there would be a bifurcated path; on one side there would be the road to consolidating a racist state made for like-minded people that share your ideals, and on the other the democracy that political leaders on opposite ends of the spectrum, Rabin and Begin praised. Unfortunately, it seems like they’ve chosen to go with the former. As Hagai El-Ad, the director of the Association for Civil Rights in Israel said, the future is in the hands of voters. “Eventually, if the vast majority of Israelis do not want democracy, they will get what they want”, he said. And as a diaspora American Jew, that is an Israel I cannot stand to defend. Funnily enough, I find Bruce's usage of the word 'he' to be inappropriate and downright incorrect in its usage. (Hint: Romi's the one on the right of the profile photo). Good to see the zionist apologists immediately denouncing a balanced viewpoint because it is not in tune with their vile racist aims. All my jewish freinds, academics, businessmen and others all condem the zionist infiltration, control and interference from wealthy American jews who offer tainted advice and sums of cash to zionist groups who in a civilised society would have been prosecuted for their actions. Jonny says it succinctly. One should cultivate one's own garden before launching an attack on another state. Israel has a well respected legal system and is a noisy democracy, perhaps more so than most countries. It will all be sorted out. I have seen Israeli college campuses with many Arab students, not to mention Arabs holding important jobs in Israeli society - unlike Arab countries. Europe and America can learn about multiculturalism by studying Israel. And the use of the writer's word 'racist' is inappropriate and downright incorrect in its usage, but people like him already know that and prefer verbal bombs. He's another disaffected Jew for other reasons in his life who takes it out on Israel. My bet is he can't stand his parents who are 'too Jewish ' for him. Romina Ruiz-Goiriena, I suggest you go walk around with a T-shirt in Syria. You'll be begging to be air lifted to Israel in no time. Israel has it's civil and social problems, just like any other western country (France has a plateful of them), but from having problems to loosing it's democratic nature is a very far-cry. Israel is a free and democratic nation. It's the only free and democratic nation on the planet that's surrounded by enemies and is under constant attack. Under these almost impossible circumstances, I think it's safe to say that it's doing amazingly well. It's very easy to sit back in your warm office and make judgments and crude generalizations that are very popular and easy on the ears. It's a lot harder to recognize the truth. 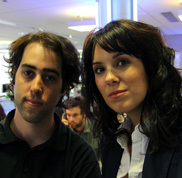 From Israel's Haaretz newspaper to the FRANCE 24 newsroom, Romina and Gilad's years-long collaboration has spanned several continents. One is an American Jew, the other a native Israeli. They share their often conflicting views on what might just be the world's most complicated country. Tête-a-tête: Is France 2 Anti-Semitic?